Once we leave home, do we still know our parents? Or do we just remember them like we remember mountains or the ocean? I was about to get to know my parents, know them in the immediate present, watch them walk, talk, scream and cry. Suddenly, I had the opportunity to get to know their living, breathing selves once again. I wouldn't have missed it for the world. This book was originally written as blog posts, composed in the clove of the moment in order to maintain an original intensity. "There are many, many Baby Boomers out there with elderly parents. This book will speak to them." "This was truly an amazing book to read; it was simply written and so easy to understand, and yet it was loaded with hidden lessons and advice about being old. Tom writes about the short and unexpected adventures of his mother that he experiences when he returns home after many years . 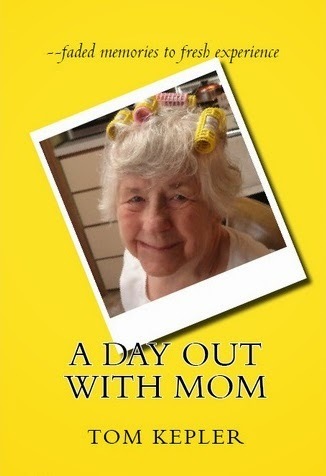 . . "
I'm looking forward to reading A Day Out With Mom. I'm sure it will bring back memories in my own life. A wonderful insight into family relationships. Mr. Kepler takes a honest look at how dementia eats holes in the fabric of our lives and how moving forward with grace and humor is often what is needed to survive. It stimulates the reader to look into her own life with more comopassion and understanding.